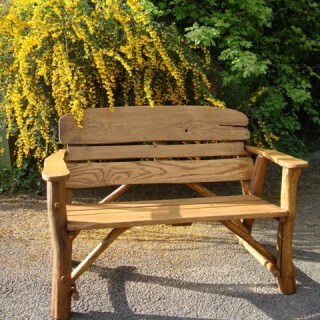 This web site is owned and operated by 4memorialbench who are completely dedicated to your total satisfaction. If you have any suggestions or comments or if you need to contact us, please email us using the link on the store page or use the details below. Our online payments are handled by either SellerDeck Payments or PayPal Website Payments depending on your choice. We accept debit and credit card payments but not American Express. Please contact us if you need a pro forma invoice which can be settled by credit/debit card, cheque or BACS. We will take full payment immediately for products we have in stock. Backordered items are not charged until they come back into stock and are ready for shipping. If you do not wish to pay online, you may call with your credit card information. If you ordered an engraved image / photograph, by sending us your image you are automatically acknowledging that you own the copyright to that image or have written confirmation from the holder of the copyright allowing you to reproduce the image. Codec Facilities Ltd does not take any responsibility for any breach of copyright caused through the engraving of an image / photograph supplied by the customer. 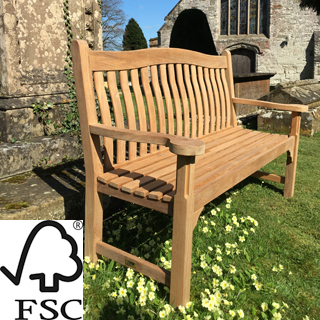 Bench installation service: whilst we make every effort to avoid hitting electricity cables or underground services (we use a cable avoidance tool), please note it is the customers responsibility to alert us of their presence. We cannot take responsibility for any damage to services. No liability for any damage is accepted or implied as some cables are difficult to detect. We cannot undertake works on the Highway. The installation charge is non refundable if the installation fitter arrives on site on the agreed date but is unable to carry out the installation because the surface is not level, the site is locked, there are cables/pipes in the ground and there is no other suitable location or for any other reasons beyond our control. We offer the service of installing your bench onto a concrete base prepared by you or anchoring into soft ground with our specialized anchoring systems - only available for mainland England and Wales standard delivery service. For orders made from the UK or the European Union, 20% VAT is added. We are PCI compliant. This means that we adhere to the most rigorous online security standards to keep your credit and debit card information safe. We accept card payments through the SellerDeck Payments 3D secure system powered by CreditCall debit and credit card processing for both online orders and mail order / telephone orders (MOTO). You will be redirected to a 'Secure SellerDeck Payment Form' where you enter your card details. o 100% PCI DSS (Payment Card Industry Data Security Standard) level 1 compliant. o Sophisticated fraud screening enabled through The 3rd Man, 3D Secure, support for CVV2 (the 3 digit card verification number) and AVS (for verifying a customer billing address). PayPal automatically encrypts your confidential information in transit from your computer to theirs using the Secure Sockets Layer protocol (SSL) with an encryption key length of 128-bits (the highest level commercially available). Before you even register or log in to the PayPal site, their server checks that you're using an approved browser - one that uses SSL 3.0 or higher. Once your information reaches the PayPal site, it resides on a server that is heavily guarded both physically and electronically. PayPal servers sit behind an electronic firewall and are not directly connected to the Internet, so your private information is available only to authorised computers. 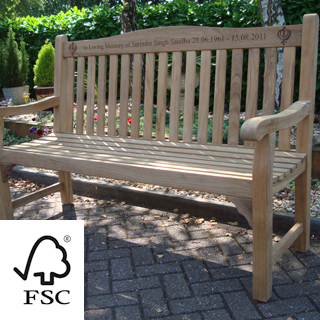 Our memorial benches are made from the finest timber and are designed for many years of use, well beyond our one year guarantee against faults in material, design or manufacture. 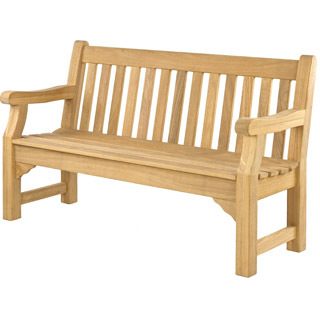 All of Alexander Rose benches which are made of roble hardwood come with a manufacturer's 10 year guarantee against faulty workmanship or materials. 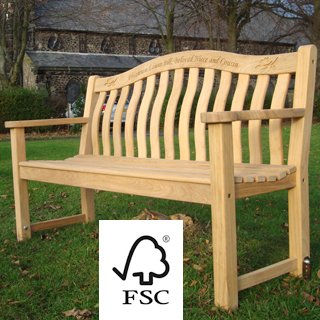 Alexander Rose pine, cornis and mahogany benches are guaranteed for 3 years. All products are guaranteed against faulty workmanship. If any item is found to be faulty, return it and we will be happy to correct the faulty part or send a replacement without charge. Upon receipt of goods, please follow carefully the instructions for assembly and advise on how to care for products. "You" and "your" relates to the natural person reading this document that is: considering purchasing, has purchased from 4memorialbench or is making an enquiry. We will use the personal information you supply to us in the course of submitting an order for the purpose of fulfilling that order. Along with, or instead of, placing an order you may have sent an enquiry to us, in which we will use the information you've provided to respond to and answer the enquiry. We may contact you by telephone, email or other means in relation to your order, for example: notifying you of delivery status, updating you on stock availability or informing you of changes with the order. You cannot opt out of these communications. We will never combine these communications with marketing promotions that you have a legal right to opt out of. We may use your data for marketing purposes but will always provide a means for you to opt out. We may occasionally use the data you supplied, in our own Legitimate Interest, to send details of products and services that we believe may be of interest to you. We will never use your data in a way that conflicts with your own legal rights and interests. If we share information with a third party, such as a payment gateway or delivery company, their use of your data will be limited to the purpose of fulfilling your order. We will make our reasonable endeavours to ensure that all third parties treat your personal data in a legal and appropriate way. We endeavour not to transfer the data of EU citizens outside the EU but where we cannot avoid it we will only do so via a third party that have conformed to all of the appropriate EU legislation providing equivalent protection to that if the data was retained within the EU. We hold the personal data that you supplied in the course of placing your order or enquiry. The data normally consists of: product information, transactional information, fraud checking information, name, address, phone number, email, special delivery instructions and potentially other information to ensure the successful completion of your order. We may hold notes of our communication with you through different channels including, but not limited to: email, live chat, CRM (Customer Relationship Management system) and phone. We will not seek personal information from you relating to race, religion, political affiliation, trade union membership, sexual orientation, medical or genetic history and we ask you not to provide such information to us under any circumstances. We will retain the personal information you supply to us in the course of submitting an order or an enquiry, for the purpose of fulfilling that order, responding to or processing that enquiry. If you place an order, we will retain an electronic copy of your invoice data for the period required by HMRC, after which we will delete it. Your information will be: securely stored on hardware that has limited access to only relevant persons; and on a server maintained by a third party such as a web host. Whether held by us on our hardware, or on our behalf by a third party, it will be kept secure and protected from unauthorised access using all reasonable means. If requested, we will pass information about you (and if relevant, your business) to legal authorities who have the legal right to demand such data. We may source data from publicly available lists of contacts to use only to target advertising as described above and again under Legitimate Interest. We never use this data to directly contact you. Our Legitimate Interest is to provide marketing information to people who have shown their interest in our products. We also have a Legitimate Interest in finding other, similar, people and we may use your email address or phone number to help find such people without any detrimental impact on you and our advertising suppliers similarly have a Legitimate Interest in displaying the most relevant ads. The third-party processors that we use are large responsible companies or organisations and we are sure they have appropriate technical and organisational measures in place to protect your data. Many of these use sub-processors themselves such as cloud services like Amazon Web Services or Microsoft Azure to run their own services. In the case of payment processors, the entire banking infrastructure lies behind them and they pass data to Visa, Mastercard, other similar schemes, the relevant card issuer and acquirer. We may use personal data for automated decision making; we may send you emails, notifications or other communication that are tailored to you and based on your purchasing history. Some advertisers, particularly Facebook and Google (but there are others), are used by us and decide what advertisements to show to people based on automated processing of personal information, in order to make those advertisements as relevant as possible to the people who see them. These advertisers should provide the means for you to opt out of such personalisation. If you have engaged with us, but never placed an order, you may request the complete deletion of your details from our systems. Whether or not you have placed an order, you may request us never to contact you again, and we will comply with your request unless you make a further enquiry with us. You have a number of rights in addition to those mentioned above, including access to the information ("the right to be informed"). If we process your data for marketing purposes on the basis of your Legitimate Interest, you have the right to object. You also have the right to withdraw your Consent to being marketed to, if you previously gave your Consent. You have the right to see the data held about you and to receive a copy. You have the right to have any errors corrected. You have the right to ask and be told where your data came from. You can exercise any of these rights by contacting us using the details below. You have the right to lodge a complaint with the Information Commissioner's Office (ico.org.uk) if you believe any of your rights are being infringed. We reserve the right to use any selected photographs of supplied by us products for promotional purposes. 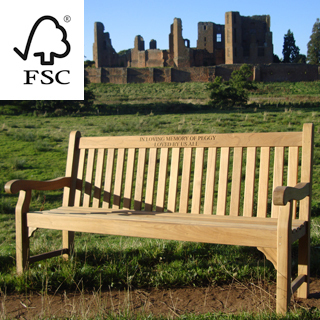 Should you object to 4memorialbench's public use of the photographs of your bench, please contact us either by phone or email. If you have any questions or concerns, please do not hesitate to contact us through our contact form , or by phone on 01564 784852. 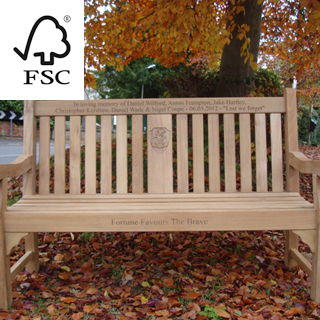 If you memorial bench has been assembled or has had a wood engraving or engraved plaque fixed to it you cannot return the goods to us for a refund. why our garden bench covers ? why our wood engraving ?